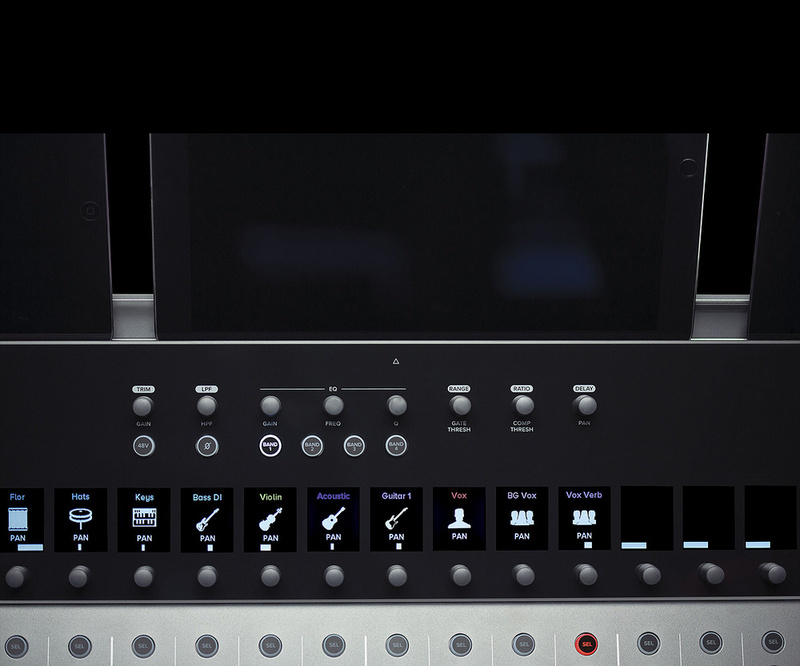 The DC16 control surface for Mackie’s DL32R digital mixer gives you the best of both iPad and hardware control. First launched back in 2014, Mackie’s DL32R is an attractively priced, Wi-Fi/iPad-controlled rackmount digital mixer. It features 36 inputs, 28 busses, 14 outputs and Dante connectivity, and possesses a fairly comprehensive list of features and facilities. Although Mackie’s Master Fader iOS app (now in v4.6.1) offers an intuitive user interface that is more than capable of handling the complexity of the DL32R, the absence of a compatible hardware control surface may well have kept it out of consideration for many professional users. 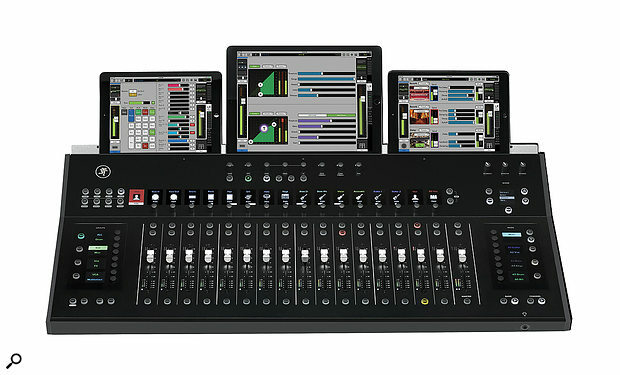 The recent release of the Mackie DC16 Digital Control Surface, which is designed to complement the DL32R and the Master Fader app, has created the Axis digital live mixing system — the modular paradigm of which offers the flexibility to cope with a range of applications, both mobile and installation. Since my esteemed colleague Paul White looked at the DL32R in detail back in the December 2014 issue of SOS (www.soundonsound.com/reviews/mackie-dl32r) I don’t propose to cover it in this overview of the system, although references to it will doubtless appear. The first thing that struck me on opening the flightcase that the DC16 arrived in was just how physically large it is compared to similar, competitive consoles that carry 17 touch-sensitive motorised faders. On the other hand, its size means that the DC16 does give an exceptionally clear view of its status, due in part to the 26 backlit, full-colour display screens, 16 of which sit at the very top of each fader strip. These screens can display not only each strip’s identifying graphic or photograph but also the parameters of functions assigned to it in text format. A 17th screen, to the left of that of the first fader, displays the identity of the input or output being worked on. A benefit of the screen size is that it allows for fonts that can be quite large, a benefit for older, spectacle-wearing engineers like myself. The other striking physical feature of the DC16 is that it has no touchscreen display and, as a result, it is a mere 8.4cm thick. Mackie appear to have made the not unreasonable assumption that there will be at least one iPad running Master Fader within the Axis system, so the DC16 incorporates an iPad holder — the Smart Bridge — that sits at the centre of Mackie’s concept of “Surface to Wireless Mixing”. An iPad running Master Fader ‘knows’ when it is sitting in the Smart Bridge so that, when it is removed — for example, to set up a monitor mix — and then replaced, its screen automatically reverts back to what was being displayed at the point of removal. This gives a seamless transition backwards and forwards between surface (Smart Bridge) and wireless (mobile) operation. Although the DL32R in an Axis system allows the wired connection (Dante over Ethernet) of two DC16s and the Wi-Fi wireless connection of up to 20 iOS devices running Master Fader (iPad, iPhone and iPod Touch), a DC16 Smart Bridge provides only space (and USB ports) for three iPads (iPad 2 and above). One USB port acts as the Control port. A Lightning-equipped iPad connected to it establishes a wired connection that gives it, via its touchscreen, full control of the DC16 and the ability to record and play back 2-in/2-out, 44.1/48kHz, 16/24-bit digital audio streams. If an older iPad with a 30-pin connector is connected to the Control port, then, exactly as with iPads connected to the other two charging ports, it can be connected wirelessly to the DL32R and, when placed in the Smart Bridge, will function both as a touchscreen interface and as part of the DC16’s display. To my way of thinking, the DC16 is perhaps best thought of as an interface to Master Fader rather than being its remote control. 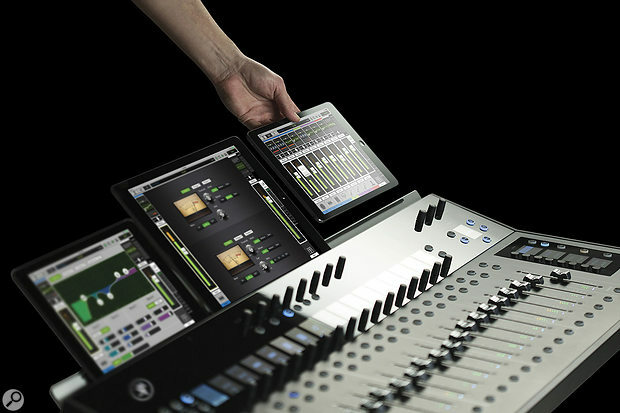 In designing the surface, Mackie have created hardware-based editing access to the app’s software functions. On the DC16, a two-row, eight-button block sits at the left-hand end of the line of fader-strip screens, the top row of which selects a single editing function simultaneously across all channels — gain, high-pass filter, send, pan, trim, low-pass filter, delay and a not-yet-implemented user-selectable function. 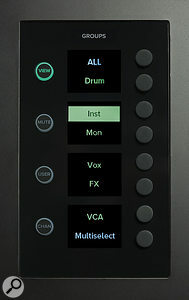 The bottom row activates editing functions that apply only to the selected channel — EQ, graphic EQ, dynamics, effects, assignment and aux sends — and can also bring up the DC16’s setup screens and the transport controls for the two-channel iPad or multitrack hard drive connected to the DL32R. At the other end of the line of screens, up/down buttons not only allow you to step through any additional pages of the function being edited, but also, when pressed simultaneously, to flip the parameters being edited onto the faders, allowing you to use these instead of the encoders. Each channel has its own high-resolution colour display, and along the top of the surface are eight encoders for adjusting the selected channel’s processing. In addition to the above, a ‘Fat Channel’, sitting just in front of the centre iPad in the Smart Bridge, gives instant access to most of the channel-specific functions whenever any of its controls are moved or pressed. The gain/trim, HPF/LPF selection is identical to that of the left-hand switch block, but the EQ section is expanded to give gain (cut/boost), frequency and Q over four selectable bands. There is no access to the graphic EQ via the Fat Channel, however the dynamics section is expanded to include the gate’s threshold and range controls, and the compressor’s threshold and ratio. Pan and delay share the same encoder and the final two buttons activate 48V phantom power and invert the polarity of the channel input. A fader strip’s select, mute and solo buttons, all of which illuminate when active, are placed within it. Metering on the DC16 comes via individual mono LED ladders (stereo in the case of the Master fader) in the lower portion of the touch-sensitive fader slots, with three-LED indicators at the top of the slots to display compressor gain-reduction status. The integration of these physical controls and the Master Fader app is fast and tight. The screen display of the central iPad (the one that could/would be connected to the USB Control port) is set automatically to follow the selected control function, giving you the option of combining touchscreen and encoder operation. The Follow Modes of the other two iPad slots can be configured separately, with probably the most useful three-screen setup being to have one giving you instant touchscreen access to the last function/channel that you worked on, and the other showing the console overview. Located at opposite ends of the surface, the Groups panel allows you to navigate custom View Groups and recall their settings and fader positions. Navigating around the DC16 is fast and intuitive, with bank and channel up/down switches to take you through channels, effects returns, aux sends, subgroups, VCAs and matrices, in either banks of 16 or across the surface one at a time. Two vertical banks of four screens and their associated soft switches that sit at either end of the fader area allow you to select and recall the fader positions and other settings of the inputs and outputs (assigned to a mix via the Assign button, or selected for viewing as part of a group). 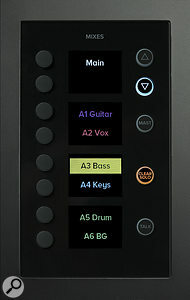 In its Mix mode, the right-hand bank gives you access to all 36 possible mixes (LR, aux 1-14, reverb 1/2, delay, subgroups 1-6, VCAs 1-6 and matrices 1-6). In its Masters mode, you can view the positions of master faders for any of those seven mix categories. 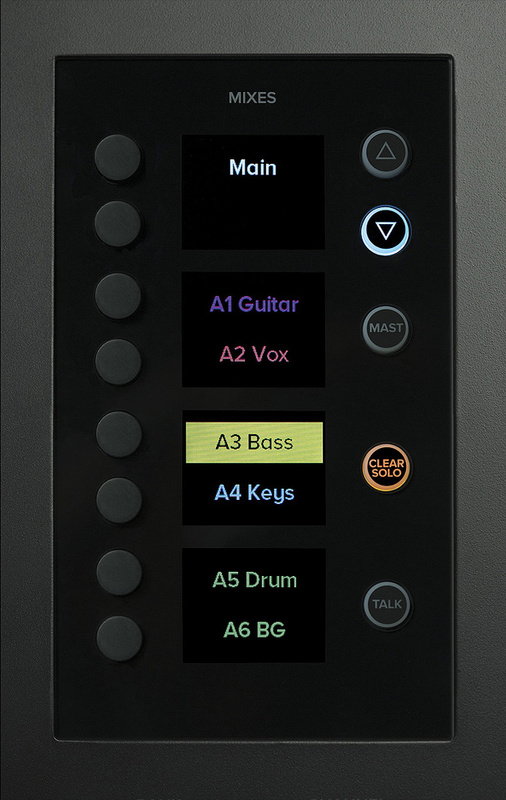 In addition to the eight mix selector buttons, another four buttons allow you to scroll through the list of mixes, switch between Mix and Masters mode, clear all active solos and activate the microphone plugged into the rear-panel talkback input. The left-hand bank of screens and switches enables you to recall the fader positions and contents of one of six View Groups, which are freely customisable selections of channels, auxes and subgroups that you want to be able to view together. Similarly, you can create a further six selections that you want to mute simultaneously. In a View Group, channels other than those selected are hidden and, in a Mute Group, only those selected will be muted. Although channels, etc, can be selected as part of View and Mute Groups on both the DC16 and Master Fader app, the groups themselves must be created and named in the app. 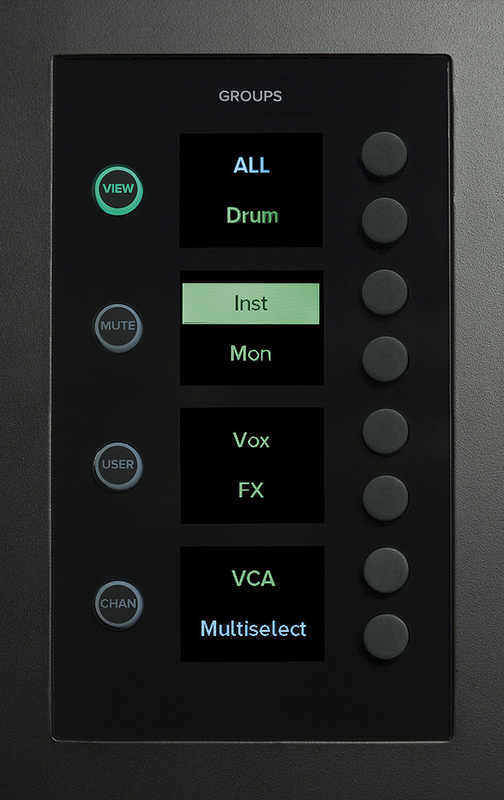 The Mixes pane calls up the settings for any output mix (main, auxes, subgroups, matrices and effects busses).The Show display, the 26th screen, sits in the upper right-hand corner of the DC16 surrounded by its associated soft switches. A Show is made up of a series of snapshots, stored in sequential order, that can be manually recalled as the show progresses. A channel safe function allows you to remove channels from snapshot recall, leaving them unchanged. Although snapshots can be stored in a show and a show recalled from either the DC16 or from Master Fader, only the app can create and name a show and name a snapshot. Currently, although snapshots can be freely selected and recalled using a pair of up/down buttons, there does not appear to be any method of re-ordering the snapshot list other than overwriting one with another. However, a More button, as yet unimplemented, holds out the promise of additional Show functionality, so one can live in hope. Finally, we come to the only analogue controls on the DC16. Talkback sets the input gain of the rear-panel balanced XLR Talkback input, whose output is routed to the DL32R via Dante; Monitor sets the output level of the balanced TRS quarter-inch jacks carrying, in their default setting, Dante-delivered monitor feed from the DL32R; and Headphone controls the output level of the front-panel headphone output, which is paralleled from the monitor feed. A rear-panel stereo TRS mini-jack can accept an input signal up to 16dBu and is intended to be the source of background or interval music. The central, wired iPad connection can also act as a stereo playback source, and the selection is made on the DC16’s setup screens. The DC16’s rear panel houses outputs for a stereo set of monitors, a talkback mic input, a stereo aux input, a footswitch socket, two USB charging sockets, USB Control port for connecting the ‘master’ iPad, an Ethernet port for Wi-Fi connectivity, and Dante sockets for connecting to a DL32R mixer. Now at v4.6.1, Master Fader has all the hallmarks of a mature piece of software. Although the DC16 is comprehensively equipped, well thought out and fast and intuitive in operation, the reality is that an iPad running Master Fader can do everything that a DC16 can do — and more. Providing that nothing goes wrong (no Wi-Fi interference, no crashes, no emergencies) then a monitor engineer and an FOH engineer with an iPad each would have little or no difficulty in setting up and running a relatively simple PA setup without a DC16 in sight. Operationally, Master Fader allows you to set up a mix offline quickly and easily, so initial preparation for a show doesn’t require anything more than an iPad and a channel list. Auxes, subgroups, VCAs, mute groups and view groups can be put together and named as required, and these then appear on the channel input routing screen where the necessary assignments can be made. Master Fader also offers a useful selection of vintage and modern EQ, compressor and gate presets that give you a good starting point for any mix. On the effects side, selecting two reverbs and a delay from the available presets is similarly simple, and you have the opportunity of editing the reverbs with some real granularity, should you so wish. Talking about granularity, the app’s reference guide takes up 333 pages, giving you some idea of just how comprehensive and deeply detailed Master Fader is. I had intended to use the Axis system to mix a concert with a four-piece band — seven drum mics, four instrument DIs, two instrument mics and four vocal mics — where I was running sound in a hall that I know well. Although the concert ended up being cancelled at the last minute (due to the band leader being taken seriously ill) so that I didn’t get the chance to use the Axis system in anger, I had done all the pre-production for the concert on it — setting up channels, monitor sends, output routing, subgroup and VCA assignment, EQ, dynamics, reverbs and delay, view and mute groups, naming and so on. I also created a new show so that I was ready to capture mixes during the soundcheck, and installed Master Fader on a second iPad so that I would have both available on the night. That whole process took less than an hour, at which point I had a setup that would go in and be up and running in no time at all and that, in theory at least, would only require setting its input gains before I could start the soundcheck. 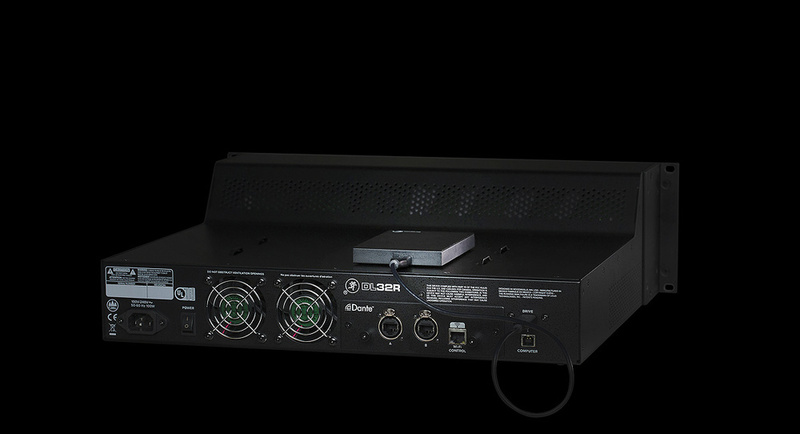 The DL32R can record and play back 32-channel multitrack audio directly to/from an attached USB hard disk. Playback is routed to each channel’s B input by default, and playback and recording is controlled from an iPad.Although the concert had vaporised, I was supplied with an HDD, strapped to the top of the DL32R, which was loaded with recordings of a show and their associated snapshots, so I was able to mix recordings, taken pre-EQ, dynamics and effects, of a rock band’s live gig in the comfort of my own garage. The B input on every channel that by default carries the USB return from the multitrack direct-to-HDD recording can also be used to route a backup input source to the same channel as its prime, allowing you to switch over quickly if the main mic goes down. Once I was mixing at the imaginary live gig, I began to appreciate Master Fader’s more practical aspects — there’s the RTA and spectrum analyser that can be assigned to any input or output; the 31-band graphic EQ on every output (and the ability to draw a curve on it with one finger); the presets available on every EQ, dynamics and effects processing; the ease with which routing and re-routing can be carried out; the View and Mute Groups; the mixer’s excellent sound quality, and much more besides. On the recording front it’s also worth remembering that the Axis system can also act as a 32-in/32-out USB audio interface and, for installation usage, can record and play back 32 channels to a remote computer via Dante. To me, the DC16 with an iPad-loaded Smart Bridge really comes into its own running an active live mix with a high channel count. As the hardware interface for Master Fader, it adds ease of access, speed and precision, and enhances the practical functionality of the app. The learning curve isn’t particularly steep, requiring little more than a basic understanding of both the DC16 and Master Fader before you can begin to mix on it. Having an iPad touchscreen available both as an integral part of the hardware mixing experience and as a mobile wireless mix platform is something that I’ve come to rely on in the workflow of my own digital console. As with any digital console, how deeply you get into the Axis system is entirely up to you, but if you want to explore the full resources available in Master Fader, they are there to be utilised in enhancing your mixes and the experience of both band and audience alike. Each of the three connected iPads can be set to behave differently, giving you instant touchscreen access to a large number of the DL32R’s functions. Looking at Mackie’s Axis as a deconstructed digital mixer — control surface, software and mix engine — there is much to like. As a total system it works extremely well, giving you the possibility of connecting two DC16 control surfaces to one DL32R via Dante, with Master Fader on two to six iPads welding the whole assembly together and offering, in addition, touchscreen control from either the DC16’s Smart Bridge or at mobile locations in the hall. The modular nature of the system means that hire companies could offer solutions from a DL32R plus a couple of iPads for smaller gigs, up to a full-blown six-iPad/dual-DC16 system for larger gigs — provided that no more than 32 inputs were required. For installations in multiple spaces, houses of worship and the like, the Axis system could also offer a very attractive solution. 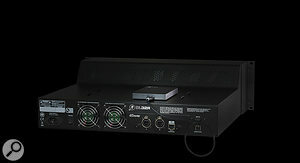 Although the DL32R itself is priced quite attractively, by the time you add in the cost of a DC16, a DL32R Dante card and an iPad, Mackie’s Axis system ends up costing significantly more than a good many of the competitively priced, all-in-one consoles offering similar functionality that are currently fighting it out between themselves in a crowded sector of the market. Whilst none of those consoles is really directly comparable to the Mackie, the Axis system, just like its more directly comparable, professional rivals, will find itself competing against several of them. Looking at more professional live-sound and install applications, to me Mackie’s Axis system stands up well against its more direct rivals. Its price, features, facilities and flexibility should prove attractive in this area of the market, where meeting the requirements of the application, the needs and expectations of the customer and the restrictions of the available budget is what determines success. Overall, the Mackie Axis Digital Live Mixing System has a lot going for it and, for many professional live-sound users, AV and hire companies, it offers a powerful and flexible system that is capable of covering a wide range of applications. Anyone in the market for a professional-level, live digital mixing solution should take a very close look at the Axis. If you’re considering a Mackie Axis, you’ll also be looking at comparably priced digital consoles from the likes of Allen & Heath, Midas, Soundcraft and Yamaha. Those companies also offer more affordable alternatives, as do QSC, Behringer, PreSonus and Roland. Master Fader app and DC16 control surface are tightly and superbly integrated. Dante integration is a big plus for installation usage. A powerful and flexible system. Requires the addition of a Lightning-equipped iPad running Master Fader to access its full functionality. The Mackie Axis is a fully featured, great-sounding, powerful and flexible digital mixing system that should prove attractive to the professional end of the live-sound and installation markets. DC16 £2400, DL32R £1595. Prices include VAT.